We’ve served the local community as experienced fence contractors for over 30 years. 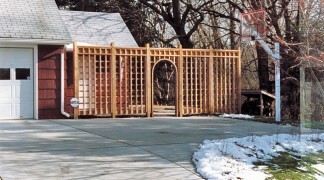 We’ll build you a fence that encompasses the best in design and function within your budget. A fence will serve a variety of practical and decorative purposes. It can mark boundaries or provide a wind break. It allows you to enjoy the privacy of your patio or yard without shutting out Mother Nature. It can deter your little ones and pets from escape or keep unwanted animals out of your garden. A fence can add a great deal of charm and character to your yard! Once you’ve determined the purpose for your fence, it’s time to choose its design and materials. As professional fence contractors, we can help you with these decisions. It is important to consider cost, longevity and maintenance. You’ll also want to consider things like landscaping, the layout of the area such as sloping or rocky patches, and how changing weather may affect stability and security. We’ll check on local regulations and recommend the best location for installation. Good fences make for good neighbors. 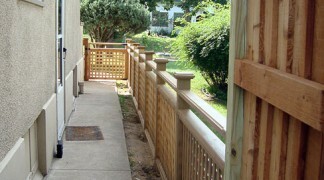 Home Customizers has been building custom fences for over 34 years and we have learned a great deal along the way. For instance, we use methods that promote long post life that no one else seems to do. We are very particular about how well crafted the final product looks. Or, if you want to put up a budget pre-assembled panel from Menards, we can do that, too. Looking to build a fence? Give Home Customizers a call! As established fence contractors in St. Paul / Minneapolis, we are pleased to offer a free consultation.